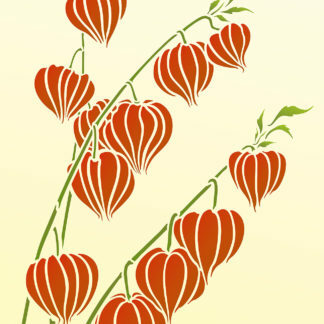 View cart “Large Chinese Lantern Stencil” has been added to your cart. 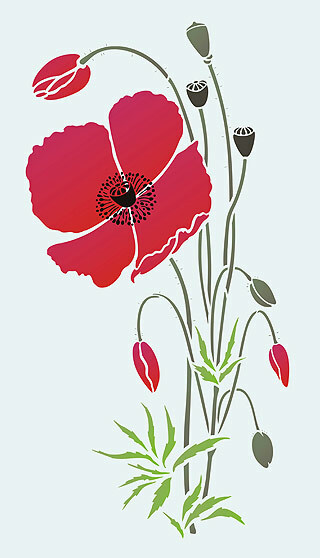 The Large Wild Poppy Stencil is a tall elegant wild poppy design based on Henny’s poppy drawings created ‘in situ’ in summer meadows. 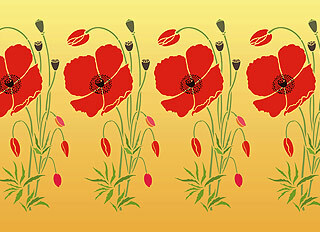 This design captures the timeless beauty and fragility of wild poppies. 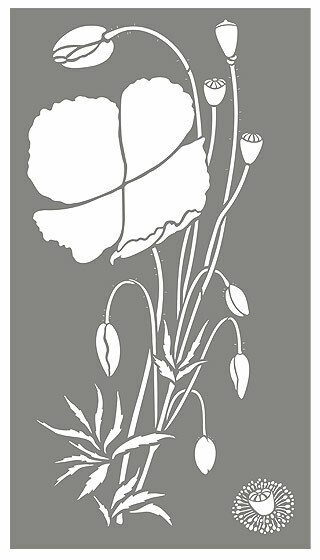 The Large Wild Poppy Stencil comprises one tall graceful wild poppy motif, with full blown petals, buds, leaves, seed pods and layer two intricate stamens. Large stencil – see size and layout specifications below. 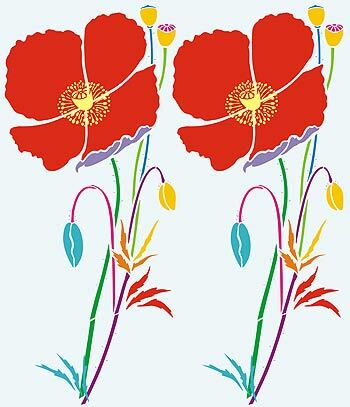 Stencil in wild poppy reds to echo life or in single bright colours for contemporary poppy fun or silhouette style for elegant feature statements. 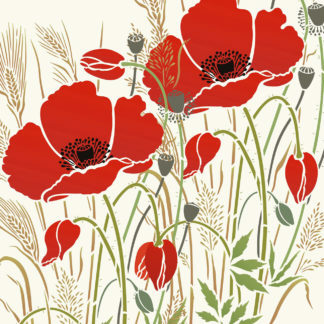 This design is beautiful stencilled on walls as features or on boards or on fabrics in both formal layouts, in rows or in clustered groupings along with our stunning Grasses Range to create that full summer meadow ambience. 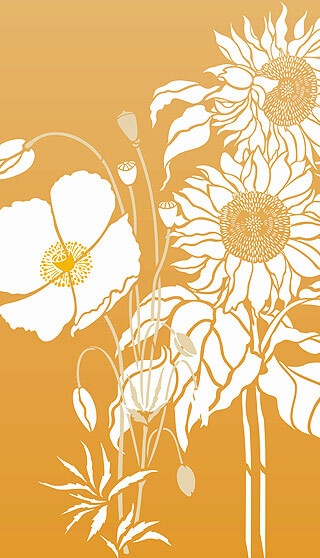 Above – Large Wild Poppy Stencil with our Large Sunflowers Stencil in Vanilla Stencil Paint on a yellow ochre background. Above – Large Wild Poppy Stencil with the Large Sunflowers Stencil shown in Very Berry Stencil Paint (poppy petals and buds), Harvest Gold, Yellow Ochre Stencil Paint (sunflower petals and seeds), Hedgerow, Verbena Stencil Paint (leaves and stalks) and Coffee Bean, Jet Black Stencil Paints (poppy seed pods and stamens). 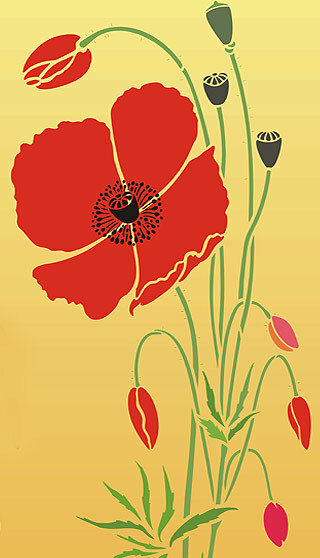 Above – the three motifs of the Wild Poppies Theme Pack stencilled in bright colours – left Very Berry and Buttercup, middle Indian Purple and Evening Primrose, right Spring Vine and Very Berry Stencil Paint. 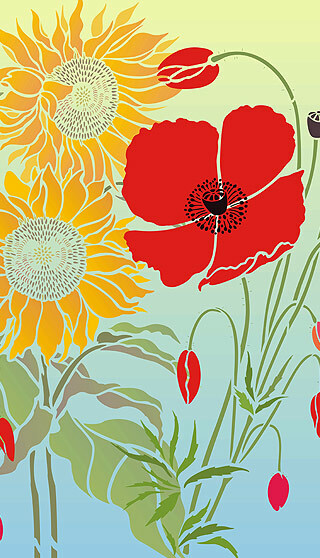 Below- the Large Wild Poppy Stencil in ‘brights’ – Very Berry, Harvest Gold (petals, leaves, buds, seed pods), Sea Green, Oasis, Indian Purple, French Lavender (stalks and petal edges). Above – the Large Wild Poppy Stencil shown on a pale aqua background in Very Berry, with a little French Lavender (flowers and buds), Olive and Verbena Stencil Paint (leaves and stems), and Jet Black and Eucalyptus Stencil Paints (stamens and seed pods). 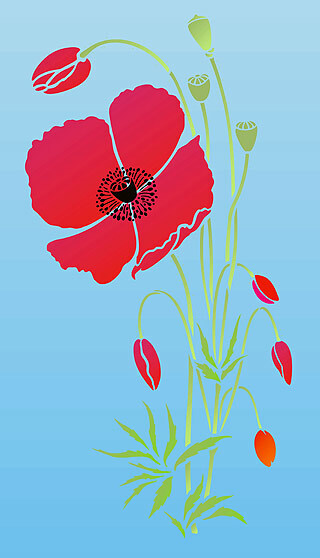 Above – the Large Wild Poppy Stencil shown repeated horizontally. 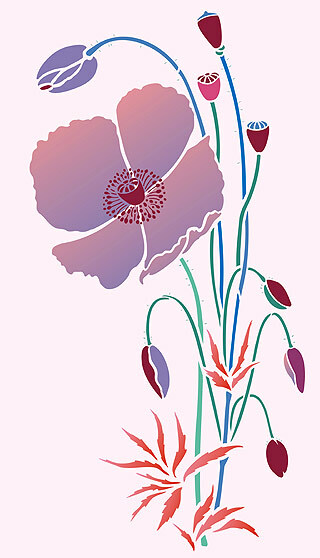 Above – try different colour combinations for the Large Wild Poppy Stencil, shown here in the non-classic colours of Forget-me-not, French Lavender, Damask Rose (poppy petals and buds), Raspberry, Azalea (stamens, pods, buds, leaves), Cyan and Oasis Stencil Paints (stalks). 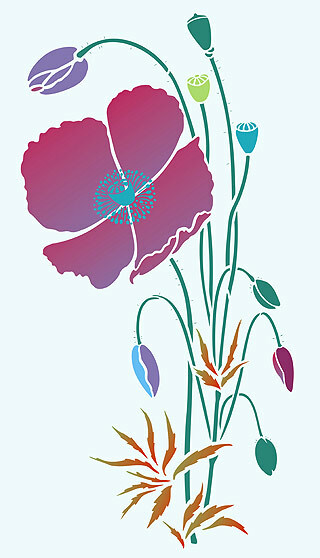 Above – the Large Wild Poppy Stencil shown in Cerise, French Lavender (poppy petals, buds) Paradise Blue (stamens, buds, seed pods), Emerald Forest Stencil Paint (stalks and buds) on a pale aqua background. 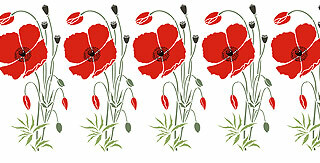 Above – the Large Wild Poppy Stencil shown in Very Berry with leaves stencilled in Ash Green, Verbena, Grassland, stamens in Jet Black Stencil Paint. Easy to use one layer stencil on a single large sheet of 125 micron Mylar. Also with separate stamen details for applying on top of flower design (bottom right hand side of stencil sheet). Sheet size 80cm (31 1/2″) tall x 44.5cm (17 1/4″) wide. 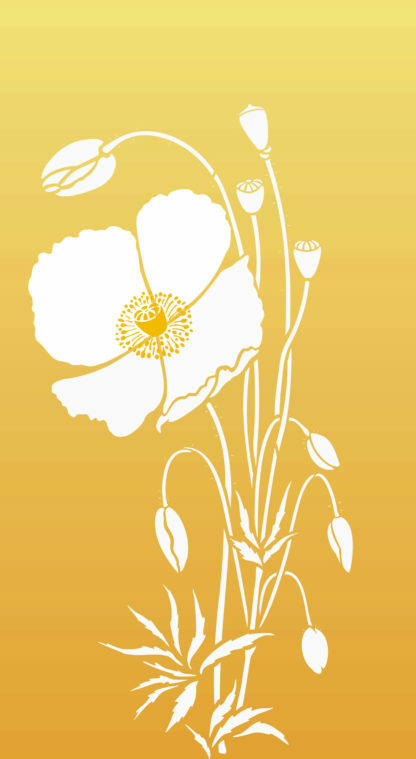 Left – layout of the Large Wild Poppy Stencil with large flower motif and stamen details for stencilling on top of flower motifs.